“We have repeatedly reviewed the growing and compelling evidence for action and repeatedly asked for action on this issue for the last three years, but to no avail. We will not bother to review the data again as everyone paying attention knows the dire situation of these stocks. Instead in the interest of time, we will request the following actions in order to fulfill the objective of the estuarine striped bass FMP-to a achieve self-sustaining population. Obviously, a self-sustaining population requires sexually mature fish, which we do not have. Action I. Eliminate dead discards. The major factor contributing to the lack of mature fish is dead discards in gill net fisheries, the most important fishery being the large mesh gill net fishery for flounder. Thus, any measure that fails to eliminate this factor is grossly inadequate and is doomed to failure. Gill nets should be removed above the ferry crossings in the Neuse and Tar/Pamlico rivers immediately. Action II. Mirror Wildlife Resources Commission Recreational measures. We support the proposal to mirror the WRC recreational size and bag limit in joint and coastal waters. These rules are a 26-inch minimum length and two striped bass, but we only support this if the nets are removed as discussed above. Implementing WRC measures without net removal will only increase dead discards as the stock recovers, waste a valuable resource, and negatively impact the recreational fishing industry (local tackle shops, guides) with no benefit to the resource. Action III. Close the directed fishery for estuarine striped bass. The present commercial fishery in the CSMA has a quota of 25,000 lbs. with a dockside value of about $60,000. The stocking program costs more than ten times this amount. This fishery should be eliminated, since more than 90% of the striped bass are stocked. As previously stated, the intent of the stocking program is restoring the population to self-sustaining, not to feed gill nets. The Coastal Conservation Association is not, as some of you have stated, a special interest group that, and I quote, “will push any agenda that leads to the ultimate closure of ALL commercial fisheries and the extinction of the commercial fishermen”. I would like to state for the public record that CCA does not support any such agenda. What we do support, is the long-term future of our coastal fisheries. We would like to welcome the new commissioners today and ask that we all put aside the rhetoric and misinformation of the past and pledge to work together so our children and grandchildren will enjoy a healthy fishery in North Carolina. No matter your party affiliation or your occupation, none of us can deny that there are many important issues that must be addressed if we want to see this bright future in our lifetime. Not all of the problems facing our fisheries are from overfishing or the use of old destructive fishing practices. There are new challenges that affect our ability to catch fish including climate change. There was an interesting article that I am sure many of you read this week about how the change in water temperature has affected the Summer flounder harvest in North Carolina. This is very important species for many commercial fishermen in this area that have simply moved further north. This is a scientific fact that cannot be ignored by fisheries managers. Changing factors such as this will not allow us to blindly accept the status quo in how we manage our fisheries simply because “it is the way we have always done things”. We support the philosophy introduced by MFC Science Commissioner Pete Kornegay in August that I will paraphrase, “Fisheries management actions adopted by this Commission, either interim or long-term, shall give highest priority to rebuilding, conserving and wisely managing fish or shellfish stocks until stock recovery is achieved or the case is otherwise resolved”. I would encourage everyone involved to reread that message before considering every issue: highest priority to rebuilding, conserving and wisely managing fish or shellfish stocks until stock recovery is achieved. 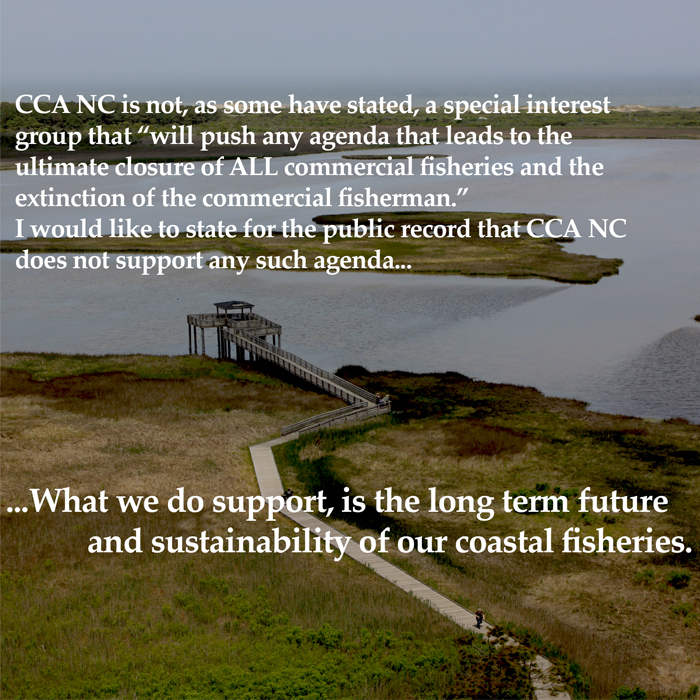 We also submitted comment in support of the reappointment of Tim Griner, a commercial fisherman and dealer from Charlotte, for North Carolina’s Obligatory Seat on the South Atlantic Fishery Management Council. Highlights from the meeting include a response from the MFC attorney on Pete Kornegay’s proposed Policy on Scientific Uncertainty where he was told the Commission could not pass such a policy that would be binding on future commissions. They could, however, include the language in each new Fishery Management Plan. Charlton Godwin presented the Division’s report on Temporary Management Measures to Reduce Striped Bass Mortality In The Tar-Pamlico And Neuse Rivers. To determine the impact of all factors that potentially influenced striped bass mortality, DMF staff re-ran the Rachels and Ricks 2018 WRC analysis to include recreational harvest and effort data. DMF results indicated commercial effort, commercial harvest, recreational effort, and recreational discards were all equally important (not statistically different from each other) in explaining mortality. The DMF report found that recreational dead discards were responsible for 20% of CSMA striped bass mortality and commercial dead discards were only responsible for 7%. (The recreational data came from creel surveys and the commercial data from ITP observer data.) This is in direct contrast to prior studies that found “Striped bass discards in the large mesh gill net fishery were identified as the primary source of mortality in the CSMA (NCDENR 2013)”, and the recommendation from WRC that “fisheries managers should reduce exploitation by focusing on reductions in gill net effort”. WRC recently raised the recreational harvest size limit in inland waters to 26-inches with a two fish per person/per day limit. DMF estimated that the same restrictions in coastal waters would result in a 96.9% reduction in recreational harvest in all jurisdictions. DMF staff ignored the WRC positions and instead recommended “that a complete no possession limit would provide the greatest protection for two important year classes.” The Commission was left with few alternatives beyond approving a motion to ask the Secretary for a Supplement to implement the DMF staff recommendation short-term while the Estuarine Striped Bass FMP was completed. If the Secretary approves the Commission request for a Supplement, DMF will hold one public meeting in the Washington area, and come back with final recommendations for the Commission at the February 2019 meeting. Of interest, the economic impacts of recreational fishing in the coastal rivers of the CSMA were reported at $3.46 million in estimated expenditures and $5.74 million in economic output impact. Average dockside value from all gill nets in the Pamlico and Neuse rivers are around $750,000 annually (2012-2017). The economic data on striped bass was not included in the report, although previous landings data indicates the total commercial value at around $60,000 annually. In a report on the Status of Rule Development to Clarify Standard Commercial Fishing License Transfers, staff confirmed that eligibility requirements for transferring a Standard or Retired Standard Commercial Fishing License are already defined in state statute. Staff further confirmed that the transfer of a commercial license can no longer be conducted on the open market and that the circumstances allowed as a legal basis for completion of a license transfer are being adhered to by the Division. DMF legal counsel also stated definitively that a commercial fishing license was indeed a “privilege license” and not a commodity to be bought and sold on the open market. An Update on the Southern Flounder Fishery Management Plan Amendment 2 presented the acceptance of the 2017 Stock Status by independent peer review and findings that a large proportion of immature fish comprise landings, there is no evidence of recent high recruitment, the probability that the 2017 stock is experiencing overfishing is 96.4 percent, and the probability that the 2017 stock is overfished is 100 percent. The Female Spawning Stock Biomass has been below the threshold since 1989 and appears to be at an all-time low for the time period presented (1989-2017). Fishing Mortality on Southern flounder has been above the threshold every year except one for the same period. Several commissioners, including Science Commissioner Pete Kornegay expressed grave concerns for the future of the fish if action is not taken soon. Staff expected the Advisory Council to vote to approve Goals and Objectives at their November 28th meeting and then meet monthly to work on the FMP beginning January 9th. Staff expects to present Management Strategies at the February Commission meeting. Despite over 20 years of warning signs, “the process” continues. I wish I had counted how many times the word “process” was used. When we get to the February Commission meeting, two years will have passed since the Commission approved moving forward with the NCWF Petition for Rulemaking on Shrimp Bycatch Reduction, yet the Division is “hopeful” they will have the Fiscal Note back from the state Budget Office soon. The CSMA striped bass has become a grow, put and take fishery, and Southern flounder continue a 20-year pattern of overfishing, and “the process” grinds on under a cloud of “political impossibility” of addressing the gill net fishery. Director Murphey also reported that it would realistically be the middle of 2019 before staff would even have developed the Goals and Objectives for the next Shrimp FMP, so he suggested if Commissioners had any ideas of what should be included, they would be welcomed. Commissioner Laughridge attempted to offer his list of suggestions and was met with immediate pushback from Commissioner Hendrickson and the three commercial commissioners. The Laughridge motion to present Goals and Objectives was tabled until the February meeting to allow time for “the process”.